The Transportation SWATeam is examining the Illinois Climate Action Plan goals and accomplishments in this theme. The University of Illinois improved its reporting on air travel emissions between 2010 and 2015. A new baseline was established based on new reporting rules and techniques, and the 2015 iCAP will work from this more solid baseline in calling for a 23% reduction by FY20, and then an additional 15% reduction by FY25. To make progress in this area, campus intends to implement a new campus bike plan and other sustainable transportation options and encourage carpooling and teleconferencing whenever possible to reduce miles traveled. SWATeams report annually on progress made toward Illinois Climate Action Plan objectives in their area of focus. 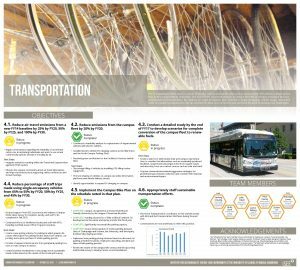 Click to view the Transportation team’s poster from the Oct. 25, 2018, Campus Sustainability Celebration. We’ve got whole page dedicated to getting you around campus and the local area using as little carbon as possible. Check out all the resources here. As of November 2014, the Urbana-Champaign campus has five parking lots/garages that feature multiple Level 1 (120V duplex receptacle) charging stations for electric vehicles: North Campus Parking Deck (B-4); Parking Deck C-7; Parking Deck C-10; Parking Deck F-29; and Krannert Center for the Performing Arts (D-5). For more information, click here.